Of course, facts being what they are he only succeeds to a certain extent – the perception of immigrants as problems or issues, after all, does have an impact on the narratives and adventures people experience and cannot really be left out. Nevertheless, his political stance is clear from the very beginning: this will not be an addition to the canon of moral panic about swarming immigrants, but rather a celebratory account of all the ways in which British history and culture have been enriched by cosmopolitanism. There is a built-in tendency to present immigrants as passive or problematic second-tier characters, as guests or mere visitors with certain obligations of deference and gratitude towards their ‘host’. Emigrants are much more dashing – adventurous, eager, intrepid, fun. This simple conception drove most of my research. Migrants ceased to be the feeble, dependent figures of so much carton mythmaking, and became plucky explorers on the sharp, often painful edge of social progress. These are happy stories and sad stories, hard-luck stories and success stories, love stories and murder mysteries. It requires a good deal of fabrication and a hearty lack of curiosity to lump the dizzying varieties of immigration – from Huguenot weavers and Indian shopkeepers to South African dentists, from Polish fighter pilots to Jamaican fishermen, from refugee orphans to Russian aristocrats – under a single heading. Some came on steamers from the Caribbean, some trekked overland in the back of lorries, as stowaways or penniless refugees (though a rarely acknowledged fact about refugees is that a high proportion of them are middle class: it takes both means and aspirations to cross half the world, however uncomfortably). Some have come on lilos, in wheel wells of aircraft, in airless trucks or beneath cross-Channel trains. Others encountered England at Eton, or Sandhurst, or through investment banks, or the first-class lounge. I picked up Bloody Foreigners as a follow-up to Enslaved by Rahila Gupta, which I unfortunately had to return to the library before having the chance to review. Enslaved is an eye-opening account of modern-day slavery, and towards the end of the book Gupta argues that contemporary border controls and immigration laws are actually responsible for putting people in the disenfranchised situations that facilitate and perpetuate slavery. 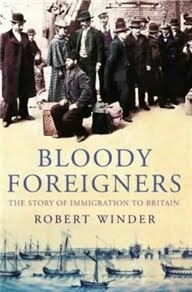 I thought it would be interesting to look at this argument from a historical perspective, and Robert Winder did not disappoint: Bloody Foreigners does cover the historical emergence of the concepts of nation and nationality (both of which are far more recent than people tend to assume), as well as the factors that might have contributed to this emergence. As with so many of the main guiding points of our social world, there’s nothing inevitable about the way we organised ourselves in fortress-like nations. Cosmopolitanism (if we may call it that at a time when the concept did not exist) was once upon a time taken for granted, and this could still be the world in which we live. I was also very interested in Winder’s account of historical shifts in the way certain nationalities and groups of people are perceived – the most staggering examples being perhaps the Irish and the Jewish. Despite the fact that we’re all first and foremost individuals, the groups we belong to do affect how others perceive us – and this may or may not bear a relationship with the groups we ourselves identify with the most strongly. What history shows us is that some foreigners are more foreign than others. This seems to have little to do with similarities between cultures, and rather a lot to do with the momentary prestigiousness (or lack thereof) of a certain backgrounds. Another reason why I decided to read Bloody Foreigners was the fact that I wanted to take comfort in history (always a dangerous and unwise aspiration, I know). I’m just reaching the end of a very difficult year in which I experienced the full vulnerability of living in a country other than the one in which you were born for the first time (without the bubble of protection offered by Erasmus communities, that is, which makes it an entirely different sort of experience). This isn’t something that is easy to articulate, but there’s something very unsettling about the very real possibility that anyone you meet at any time may be predisposed to be hostile to your for no personal reason other than the accent you reveal when you speak. You know this will not turn out to be the case with the great majority of people, but still, every minute of the day the possibility is there. And sometimes there’s no hostility but a slightly impatience or annoyance, assumptions about your level of literacy or your intelligence, a constant othering that puts you ill at ease. You find yourself scrutinising people’s manner to discern a cause, but the fact is, you’ll never really know. Of course, as a white, educated and middle class person I’m still very much enshrined in privilege, but nevertheless the vulnerability is there. And day after day it unsettles you and wears you down. But did history prove comforting, you ask? Bloody Foreigners was at the very least a reminder of how very human my recent experiences actually are. This may seem to contradict my previous point about the lack of a one-size-fits-all immigrant experience, but I don’t think it does, actually. Reading these stories reminded me that everywhere you go there will be kind people and people who are not so kind; that throughout history there are countless people whose life stories have points of contact with my own, but there is no set pattern, no fixed narrative that my life is bond to follow. 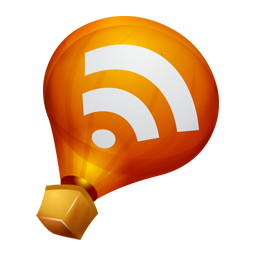 Something as simple as this can return you a heightened awareness of your own humanity at the time when you need it the most. But enough with the personal asides: Bloody Foreigners is a brilliantly researched, vivid and highly readable book that most lovers of social history are likely to enjoy. At times I wanted Winder to have included even more detail, but in a book that’s almost six hundred pages long, that’s probably very telling. This definitely sounds like a really interesting book, and great when books can fit our personal lives like that. I can't imagine the stress that could cause, living in another country, but hope that it decreases with time. I'm adding this to my wish list! 'And sometimes there’s no hostility but a slightly impatience or annoyance, assumptions about your level of literacy or your intelligence, a constant othering that puts you ill at ease.' I can imagine you getting reactions like that over here, as I'm like that sometimes, very impatient and very judgemental. I get kind of defensiveness to protect myself fromt he feeling that I'm creating the most embarrassingly awkward conversation ever and that old British idea of blasting through as if you know exactly what someone is talking about, but um...that's not helpful, obviously. My self-conciousness should not make me rude and judgemental - tries harder. I hope it's not going to spoil your memories of this time. Immigration is a big deal here in Brussels and a common topic of conversation. Not only because of the European Union/NATO's HQ, but also because there are so many immigrants in the city. The "old immigrants" who came in the 60/70s and the "new immigrants". These last ones are divided into the ones that still come because of harsh conditions back home and the well-educated, high-income expats. It's very interesting to see the interaction between these groups. Anywhooo, the book sounds interesting. I'd like to find a similar one about a country (like ours) that used to be a country of immigration and now is a welcoming country. Is such a country more predisposed to accept foreigners? Amy: I think you'd definitely find it very interesting! Jodie: Don't worry, it won't soil my memories. I do completely understand that there are a million reasons why people may come across as reserved, standoffish, impatient or annoyed in a conversation. I know I've done it myself in tons of different situations (it's definitely not just you), and it can be anything from the fact that I'm generally shy to my mood that particular day. I don't try to read everything in terms of prejudice, but what can be unsettling is the uncertainty, you know? One person in 100k is that BNP voter, and you never know if it's them you're dealing with that day. Of course, the odds are tiny, and I know that the fact that I'm white protects me from lots of things other people unfortunately have to deal with. But what I was trying to get across is that knowing that the possibility IS there can still make you uncomfortable. It's like this background noise always on the edge of my awareness. I hope this makes sense! Alexandra: From what we've seen in the news in recent years concerning the rise of right-wing extremism and race-related violence in our country, I'd say that unfortunately not really! What you say about the interaction of different groups of immigrants who belong to different social spheres and are integrated to different extents also interests me a lot. There was some of that here, and also in The Hare with Amber Eyes. For example, some of the worst prejudice against poor Jewish refuges in the early 20th century and leading up to WW2 came from established Jewish communities that didn't want to be "tainted by association". I think that says a lot about how human beings tend to work. Lately I have been getting a rash of emails from some of my very close friends and family decrying the evils or immigration, and I just wish it would stop. It's a hot button issue here in the states, but I have a feeling that people make a bigger deal about the problem that it creates than it merits. I would love to read a book that celebrates emigres and immigrants, instead of reading all the ire that these well intentioned but ignorant people seem to like to send me. This was a great review of a book that I would really love to read, so thanks Ana, for putting it on my radar! Oh, I so want to read this! But at work and in my life (especially at my local pub! ), there was a lot of "us" vs "them" and sometimes I was "us" and sometimes I was "them." Even knowing how incredibly privileged I was on the foreigner scale, it was at times incredibly awkward, eye-opening, and hard. The novel that I will probably never finish writing is actually about that year and these issues. I've been back in the States for 8 years and I'm still trying to sort out some of those feelings. Immigrating to another country is *very* hard. I wonder if there are similar histories written for other countries? Would be interesting to compare. Jennie: I really, really hope you finish and publish it, because I would LOVE to read that novel. It's so hard to find people who even understand this kind of privileged-in-the-foreigner-scale and yet still often uncomfortable experience, let alone books that reflect it. Heidenkind: I bet there are some from an American perspective at least. I should investigate! Vishy: Very true about the flow originally happening in reverse. And yet you don't often hear the word "immigrants" in those cases - more likely it will be "settlers", "adventurers", "explorers", you name it. It's funny how the terms people use can so clearly signal the kind of story they want to tell and how they want to be perceived. Looks like a fascinating read and it will probably forever be a topical issue. In Germany people also still haven't understood that if you're not white you're not necessarily from somewhere else "originally", grr. The kindly interested ones are sometimes even worse. This book sounds like a breath of fresh air. Most books I've read on the subject always find a way to paint immigrants in a poor light or at least focus on the popular opinion at the time concerning all of the social ills that immigration brings. Being the granddaughter of immigrants this is a subject that is near and dear to my heart.